AnyOption, launched in 2008, is one of the pioneer brokers in the binary options trading industry. We carried out a comprehensive review of Anyoption broker to evaluate whether it is still pioneering the industry in terms of offering quality conditions for trading. After searching various websites and forums, we didn’t find any weighty negative user feedback regarding AnyOption. Some of the complaints we noticed were about novice traders who seemed to have made risky and uncaring trade decisions. So Anyoption is not scam, it’s one of the most reliable brokers. Overall, we can confidently affirm that AnyOption is a very credible broker, particularly because it is fully licensed and regulated by the Cyprus Securities Exchange Commission (CySEC) under license number 187/12. What’s more, the broker is also under the watchful eye of other regulating bodies around the world, including European Securities and Markets Authority (ESMA), Markets in Financial Instruments Directive (MiFID), Financial Conduct Authority (FCA), and many others. So, you can be certain that AnyOption is not a scam broker and you cannot lose your funds fraudulently with the broker. One major drawback we discovered from our AnyOption review is that it lacks sufficient regulation to allow U.S.-based traders. The broker offers a user-friendly and innovative web-based platform that allows traders enjoy a hassle-free and profitable trading experience. 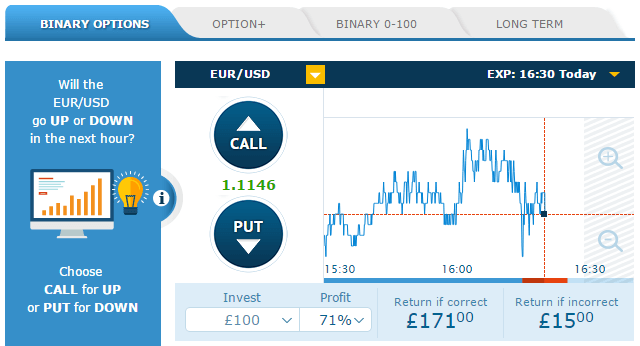 You do not need to download any software before starting to trade binary options with AnyOption. During our AnyOption review, we observed that the broker does not offer a free demo account to traders. Nonetheless, we noticed that the broker has designed their service in such a manner has to render a demo account unnecessary. This could be a big merit because it saves you the hassle of signing up for a demo before enjoying the rewards of binary options trading. To try out AnyOption’s trading platform, you just need to go to the broker’s site and assess the different features of the platform without the need of registering for a demo account. AnyOption’s trading platform has a wide range of unique trading tools, including Option+, Binary 0-100, and One Touch. AnyOption offers more than 100 financial assets for trading, including stocks, indices, commodities, forex, and interestingly, Bitcoins. Remarkably, you can trade any of your preferred assets even if the markets are not open. In terms of payouts, the broker offers up to 94% profit and 5% refund on investment. This means that you can gain whether your trade turns out positive or negative. For example, if you invest $100 in a trade, you could get a return of $194 if the trade is correct or $5 if the trade is incorrect. AnyOption offers a fast and easy registration process of new accounts—we noticed that it takes less than 3 minutes to open an account and make a first deposit. 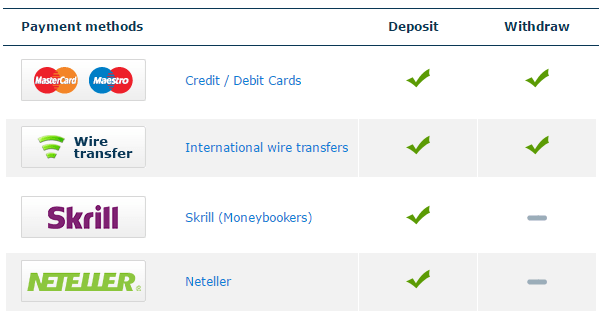 AnyOption provides various secure and popular deposit and withdrawal options to customers, including debit and credit cards, wire transfer, Skrill, and Neteller. The minimum first deposit required with AnyOption is $250. Importantly, the broker keeps customers’ capital in segregated accounts and the funds are solely used for completing the orders made by the customers. Once you’ve opened an account with the broker, you’ll be given a tailored account type based on your deposit amount, preferences, and trading style. AnyOption does not have predefined account types. Furthermore, the amount of bonus you will earn will be determined on a case-by-case basis, and can reach up to 50%. The withdrawal process is fast and without much hassles—you just need to submit your request and the rest will be handled quickly. Our AnyOption review has revealed that the broker offers reliable and professional customer service. Broker’s site is in different languages, so you can always choose to use a language that suits you the most. Furthermore, the multi-lingual customer support staff can be reached anytime, 24/7, through email, phone, or online chat. The broker’s site also has widespread educational materials and tools you can use to take your binary options trading career a notch higher. After opening an account, you will be assigned a dedicated account manager who will help you remain focused and profitable with your trading. Our AnyOption review has revealed that the broker is still pioneering the industry in terms of offering the right set of tools and a healthy environment for traders to make the most out of their trading activities. There are also talks about a possible IPO in the London stock market. Broker is rightfully the pacesetter in the industry. Notably, we are pleased with the broker’s simplistic approach to trading, and this could be the main reason why it has remained at the forefront throughout its years of existence. Whereas the binary options industry is getting crowded with all sorts of brokers, it can be a good idea to stick to innovative brokers, which has remained trader-focused from day one. I would never fall a victim of investing with highlow binary options again I met a broker from there who told me to invest with them so I did I invest £32000 with them for a start thinking I was doing the right thing later I decided to make withdrawal but they started coming up with things I don’t understand like not letting me gain access to my account but thank God I reached out to taylorbrennan@consultant,com a financial recovery expert, he was really kind to help me get back all my lost money. i was a victim of binary option scam, traded with bank de binary and a couple more and was able to start with a 200pounds investment on each and then i emptied my credit and debit card all in hopes of getting better return. After a while I decided to withdraw some funds from my trading account i could tell something was wrong, unfortunately my request sat pending for weeks, no one was picking my phone calls anymore, response to my emails was lesser and at a point stopped, I had to try charge back which didn’t work out, I paid a law firm in Israel but they couldn’t be of help, another money lost on that.. Finally i stumbled across this company calagarysecurity dot org, they did what i never believed in, firstly i had doubts on how they were going to get my investment back but trust me i got about 80% back. Anyoption is pure SCAM. Let's start from the tools for investing: for most of the options the time frame is limited to 30 minutes and end of day/week. So you can not trade a 1 minute, 1 hour, 2 hours etc etc... PUT ora CALL - which is quite limitating. Sedondly the opening of US stock trading is delayed of 10 minutes, which don't allow the investor to take advance of the opening fluctuations. Secondly when you want to withdraw your money in the best case there is 3 days waiting time for the operation to be done: even worst, in my case, my documents were not approved (tehy still are NOT approved after 4 months) and they said my card is not eligible for withdraw and never had a final answer. Thirdly, the staff is very insisting on you making deposits all the time, not to rate the mobile app which is also terrible. Stay away from this option trading platform !! !